Left: The Nesthouse, Jonathan Avery’s tiny house creation features lots of charm with practical functionality. Avery’s designs can be viewed at TinyHouseScotland.co.uk. -Photo ©Jonathan Avery 2016. Above: Avery in his own kitchen, which is fitted with the beautiful custom made cabinetry for which he is known. With the chasm between homeowners and those who would like to be, growing ever wider – more people are looking to the concept of the tiny house as a solution to the problem of affordable housing. One individual is deeply rooted in turning that concept into a reality. 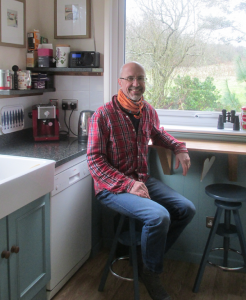 Jonathan Avery has his own unique style and philosophy, and is helping to shape this new market with innovative ideas in his newest venture, Tiny House Scotland. Avery has quite an interesting history with an eclectic background. His education began in botany and ecology, demonstrating an early interest in the natural environment. He also discovered a penchant for rescuing old structures in need of a white knight, with his first project being a London flat conversion in 1986. Since then he has renovated some derelict cottages and even converted a former threshing mill into a workshop. He has created spherically in all directions; working in graphic arts, photography, garden design, architecture and most notably, furniture design. Inspired by the clean, mid-century modern lines of Frank Lloyd Wright, and the infinitely practical style of the 19th century Shakers, Avery’s furniture designs were both functional and innovative. His cabinetry and freestanding pieces had a warm, welcoming feel with bespoke shapes and organic paint colours that became popular enough to be produced as a product in themselves. His highly successful design firm had showrooms in both Glasgow and Edinburgh. 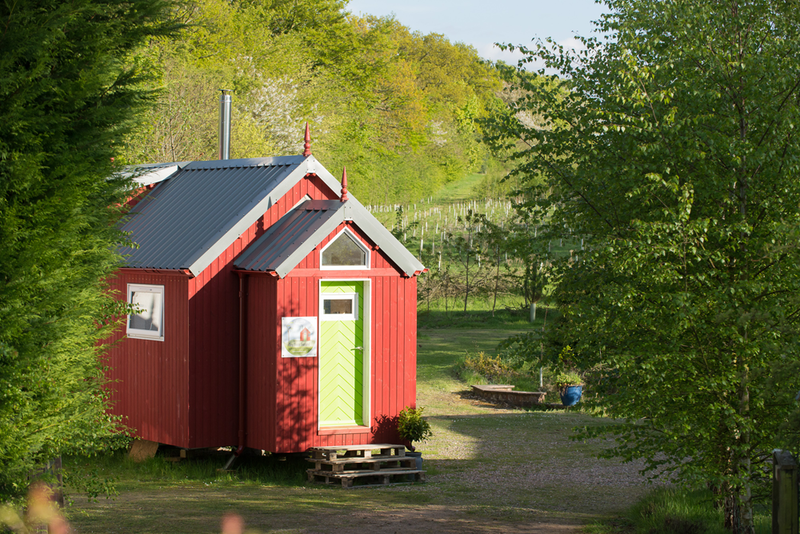 In 2014 he formed Tiny House Scotland, with the goal of building the ultimate small living space. The idea of creating structures that were both affordable and sustainable became an all-consuming passion to the point that he has decided to devote all his time to the project. This same eye for great design married with practical functionality has led to the creation of the Nesthouse. This diminutive little dwelling is just 3.4m in width and can be built from 4.0m to 6.4m in length. The homes are designed to be energy efficient and have the capability of being either completely off-grid or hybrid powered. The beautiful cabinetry and fitted furniture pieces can also be a part of the build, depending upon the homeowner’s individual preference. They may be used as a permanent place of abode, a studio or garden cottage. The Nesthouse demonstrates that a sacrifice in space, does not equate to a sacrifice in style. For a complete explanation of materials used in the Nesthouse and floorplans, visit TinyHouseScotland.co.uk.